A Polish-Russian school in Grigiškės is 88 years old already. Now its building has a sizeable tri-lingual writing (in Polish, Russian, and Lithuanian) saying that the “Gimnazjum in Grigiškės” is located here. In July of 2015, pursuant to the order of the Minister of Education and Science, the secondary education curriculum of this school was accredited, thanks to which it was granted the “gimnazjum” status [an official secondary school status that would prevent them from being transformed into a primary school or progimnazjum due to the school reorganisation plan in Lithuania; translator’s note]. The celebration, which took place on 25th February, gathered the whole community of this Russian-Polish educational institution, former and current teachers, and distinguished guests: clergymen, representatives of the state authorities and local government councillours of Vilnius, as well as numerous friends and well-wishers from Poland. 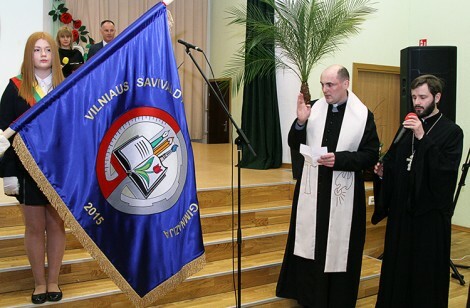 The celebration of the Gimnazjum in Grigiškės inauguration began with carrying in the school flag with the new name embroidered on it, symbolising the next important stage of the school’s life. The act of hallowing the gimnazjum’s flag was performed by following priests: Fr. Andrzej Andrzejewski, the Holy Spirit parish priest in Grigiškės; and Fr. Konstantin from the Orthodox Church of Ss. Constantine and Michael. The gimnazjum anthem was also sang – one that was composed for this occasion by Włodziemierz Saszenko to the lyrics written by teachers of the school. “We are proud that we achieved the ‘gimnazjum’ status,” Hanka Grzybowska, the headmaster of the Gimnazjum in Grigiškės, told “Kurier.” “It wasn’t easy but we managed. We owe this success to the teaching staff fully devoted to their work, which did not lose heart when we were threatened with the school reorganisation and degradation to the primary level. We succeeded also thanks to the authorities’ favourable decisions, including those of our representatives from the Electoral Action of Poles in Lithuania, who decided that schools in the outskirts of the town – the so-called “peripheral” ones – had the right to apply for the accreditation of the secondary education curriculum on special terms, so with a smaller number of students. When delivering the positive judgement, the accreditation board virtually did not have any reservations as for the working conditions in the school. “We have very good technological resources, excellent teaching staff, and so we met all the requirements. Today we have 375 students, who learn in two sections: Polish and Russian,” the headmaster said. Quantitatively, the Polish section gives way to the Russian one a little, but it influences quite substantially the ethnic composition of the district, where the Russian and Belarusian immigrant population predominates among the inhabitants. “The school is extending. Since we carried out the building renovation, parents have noticed that positive changes occur in the school and more and more students have been attending it,” Hanka Grzybowska pointed out. The teaching staff consists of middle-aged people; only this year three young educators joined it. “We’re glad that the majority of our teaching staff consists of our former students who come back to their old school so as to stand on the other side of the professorial desk. Those are real patriots of their school, who work sparing no effort. It’s a good, harmonious team,” the headmaster enjoyed. Today a beautiful building renovated from both the outside and inside pleases the eye. “The renovation was carried out in 2010. We obtained the permission for the renovation works at the time when representatives of AWPL [Akcja Wyborcza Polaków na Litwie; trans. Electoral Action of Poles in Lithuania] were in the local government’s administration in Vilnius. I admit that until quite recently the school was in a pitiful state indeed; it appeared much worse than the neighbouring gimnazjum with Lithuanian as a language of instruction. Today we have beautifully equipped offices, good teaching staff; we meet with a very friendly attitude on the part of the parents. Recently lots of them have taken their children from the Lithuanian school and enrolled them in ours,” the headmaster told us. As she says, the special atmosphere is a significant argument for attending the school. “I am proud of the fact that in our school we constantly preserve the traditions of three nations: Polish, Russian, and Lithuanian. Under one roof there is place for two religions: Catholic and Orthodox. The religion classes are conducted by a priest and lay sisters, as well as an Orthodox clergyman,” the headmaster assured. During the inauguration, a congratulatory letter from Jarosław Czubiński, the Polish ambassador to Lithuania, was read by Monika Zuchniak-Pazdan, in which he wished the school “invariable standing on the guard of Polishness in Lithuania over next decades.” Zuchniak-Pajdan, however, is the 1st Legal Adviser of the Consular Department of the Embassy of the Republic of Poland in Vilnius. Congratulations on the inauguration were expressed by the guests, for example by Jarosław Narkiewicz, the Deputy Chairman of the Seimas of the RL and a Member of Parliament as a representative of the AWPL. He gave thanksgiving letters to the teachers who had contributed to the school’s life: Polish teacher Teresa Bielak, art teacher Nijolė Jodkienė, technology teacher Irena Pomarnacka, Russian teachers Tatiana Biskupska and Swietłana Rogowska, initial education teacher Krystyna Zienkiewicz, mathematics and information technology teacher Ala Wakar, mathematics teacher Lucja Stefanowicz, and Headmaster Hanka Grzybowska. Being part of “Macierz Szkolna” [trans. Educational Society], numerous friends from Zabierzów, Olsztyn, and Tomaszów Lubelski also appeared at the inauguration. “Our partners give us strong support – both spiritual and material,” admitted the headmaster gratefully. “Thanks to them, our school has been enriched on many grounds: children go to Poland for a summer camp, offices are equipped with new furniture, and libraries become richer thanks to fine new books that fill them. I am proud that I have such wonderful friends. The history of the school dates back to 1927, when the Kaunas- Vokė Primary School was opened in the Leszczyński family’s house in the Vokė village. After a fire of 1944, it was relocated to paper mill director Grigorij Kurec’s stone bungalow, where students were taught in two languages – Polish and Russian. Forty children attended it then. Up to 1989 classes had been conducted in Russian and Lithuanian. At the time of the Polish national rebirth, thanks to the initiative of the school’s teachers with Antoni Miłto as the headmaster, parents, and the local club of the Association of Poles in Lithuania, and especially as a result of Leonard Klimowicz’s and Andrzej Gott’s endeavour, the first Polish class was formed. In 2001 the eldership in Grigiškės signed an agreement on the partnership with Tomaszów Lubelski, Poland. Those ties influenced the school’s life positively, and the students had a lot of opportunities to have real contact with Poland and their native language. Although the Polish classes in Grigiškės were not so numerous, traditions were cultivated with lots of attention. It was teachers such as Mirosława Siagło, Alfreda Kiršienė, Jadwiga Žerdalavičienė, Żana Tomaszewicz, Czesława Szurpicka, Irena and Sylwester Pomarnacki, Jan Narwojsz, Natalia Popławska, Ala Wakar, Lucja Stefanowicz, and many others who cared for it. Since 2007 the headmaster position has been occupied by Hanka Grzybowska. The school has changed for the better year by year, and new partnerships have been formed with countrymen in Poland and Belarus.